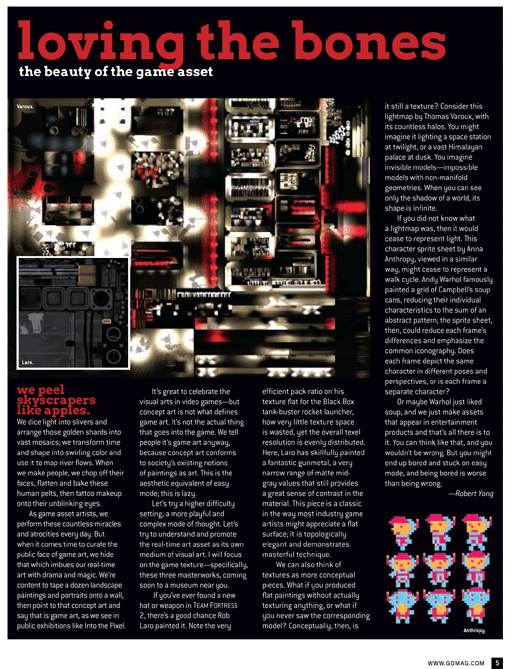 I adapted my blog post into a short article for the October 2012 issue of Game Developer magazine, promoting the art of the humble texture flat as its own art-form and mode of appreciation. The three masterpieces discussed are: Rob Laro's tankbuster sheet, Thomas Varoux's palace lightmap, and Anna Anthropy's miner spritesheet. Together, I thought they represented a good cross-section of non-photorealistic / desktop / mobile / 3D / 2D / environment / character art going on today. 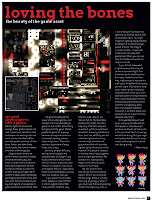 Pick up an issue of GD mag at the game convention nearest you, or squint at this low-res but somewhat legible clipping to the left.